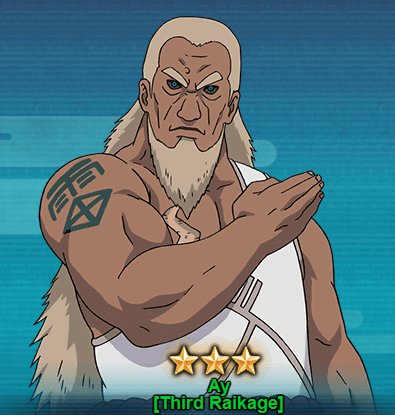 Ay [Third Raikage] was not only strong in Naruto series but also extremely strong in Naruto Online game if you use him right. He is one of the strongest Raikage and the father of Ay [Fourth Raikage]. Darui learned Black Lightning Technique from Ay [Third Raikage]. He was reincarnated during the Fourth Shinobi World War and defeated by Naruto by deflecting Ay [Third Raikage] power to seal him off. Let’s take a look at Ay [ Third Raikage] abilities in Naruto Online game. Taijutsu & Ninjutsu Thrust of Hell – One Fingered Assault [Prompt] : Causes Lightning attribute damage and Tag to a line of units from the opponent’s team, a selected unit will also suffer from Repulse. Ninjutsu Lightning Style – Black Lightning: Chases and Attacks a Repulsed unit, causes High Float and Paralysis. Can be triggered two times each round. Taijutsu & Ninjutsu Lightning Style – Liger Bomb: Chases and Attacks High Floated unit, causes Knockdown and Immobile. Ninjutsu Cloak of Lightning: Becomes Immune to Low Float, Repulse and Knockdown. Your unit will increase its Attack and Ninjutsu by 1% and it will also increase its Defense by 2% for each extra Chckra points over each one Chakra point you posses. You can get Ay [Third Raikage] from Land of Lightning Treasure. You need to draw 180-220 seals scrolls from this treasure to receive Ay [Third Raikage]. I’ve seen Ay[Third Raikage] available in Spending Rebates and he might be available in such events again in future.